Last week, New Jersey governor Chris Christie made headlines (in a small segment of the population at least) by poo-pooing entreaties to extend the Camden-Trenton River Line to the Statehouse, telling riders to “Use Uber” instead. Now, the River Line is seemingly mediocre transit; despite forming a strategic link between two depressed cities, and connecting to strong transit options on both ends, its farebox recovery is atrocious (although it has shown some returns for the region). The Trenton Transit Center is on the far eastern end of the heaviest job concentration in Trenton. 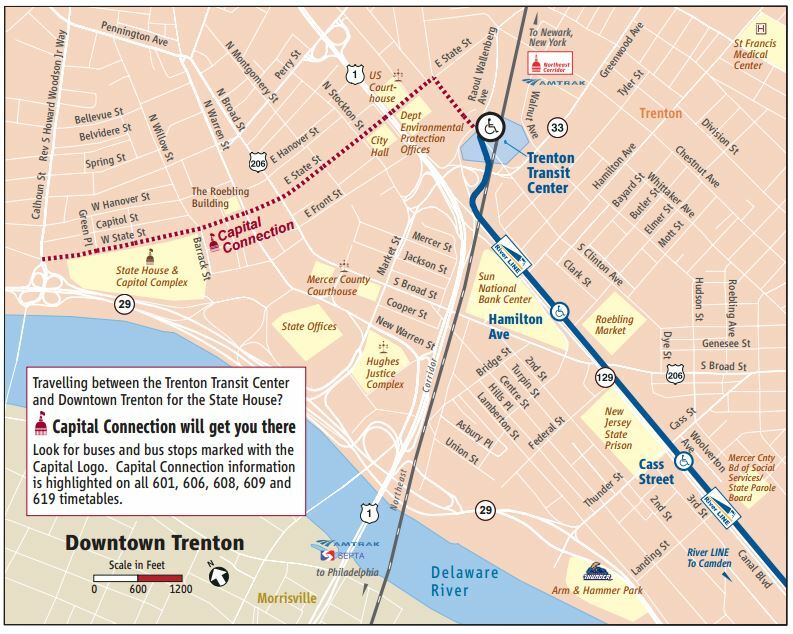 So: even if the River Line is mediocre transit, extending it a few more blocks into downtown Trenton isn’t a waste–it’s a key network connection that holds potential to be highly useful to lots of riders. And that’s where my take on the potential extension differs from Gov. Christie’s. Where the governor sees a question of expanding an underperforming transit system–that is, in a sense, rewarding underperformance–I see an attempt to redeem that same system with a relatively minor expenditure based on the principle of network connections. Indeed, is it possible that the statehouse connection could be the key to unlocking the River Line’s overall potential? 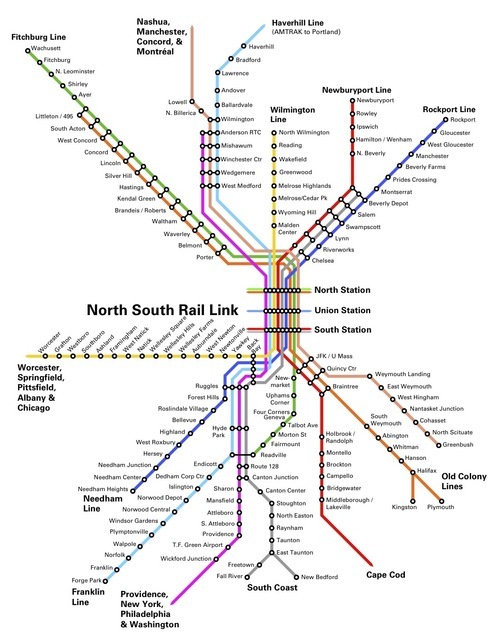 Baker’s commitment to this dichotomy has played out mostly in his administration’s skepticism toward the Green Line Extension into Somerville and Medford, and to a lesser extent on the North-South Rail Link. Baker has a point, of course, that MBTA and the state of Massachusetts have shown little capacity for effective project management, and there is a crying need to fix the maintenance and State of Good Repair backlogs facing the existing system. One vision for a post-NSRL network, from the NSRL website. 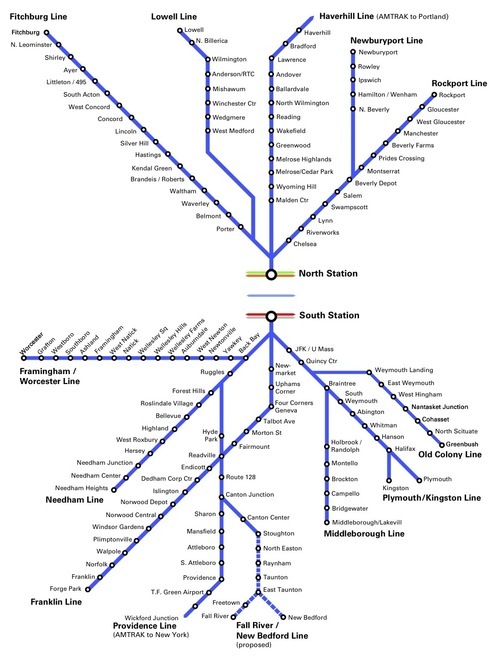 Once more with feeling: Transit is a network, which means that its parts are interdependent. You cannot think about it the way you think about libraries or fire stations, where putting one in a certain place clearly benefits the people there, because the whole network affects everyone’s ability to get everywhere. This is the key concept that, it seems, Christie and Baker have failed to grasp. Certainly, there are transit expansions that benefit only a discrete set of people within a region; many (politically popular) commuter rail and light rail extensions into low-density areas fall into this category. 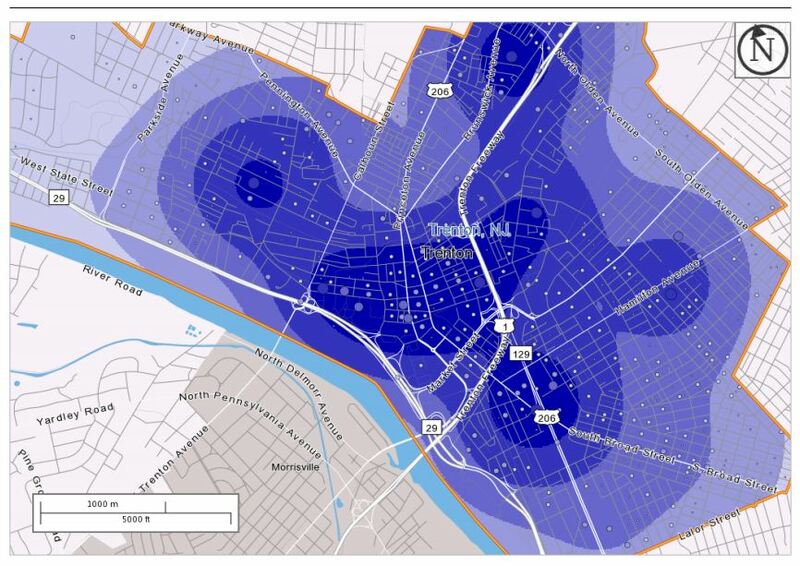 But many “expansions” have utility well beyond their own immediate area. The key is for decision makers to be able to differentiate between different kinds of “expansion”–and, in fairness to Christie and Baker, the political incentives are largely set up to make this differentiation hard. Politicians face pressure to “give” everyone (that is, all geographic areas) benefits from government spending, which–and this is where we return to the parallels with the core/periphery problem–incentivizes spreading money around inefficiently rather than investing in geographically central yet regionally (networkily?) beneficial links. Would Christie or, especially, Baker, be more willing to risk some political capital on an “expansion” if it were seen as a key network link rather than a luxury whose benefits accrue to one particular area? Maybe, maybe not. But those of us with a stronger grasp of the concepts behind the transit can work on educating, those nonspecialists whose first instinct is to respond to the loudest voices.